Iran has a rich culinary history, and rice resides at the heart of the Persian cooking tradition. Rice was likely introduced to Iran from India during the rule of Darius the Great in the 6th century BCE. Over time it became a staple food item for Iranians, cultivated in many sophisticated varieties. A multitude of flavorful and fragrant rice dishes have emerged throughout the centuries… saffron-scented rice, cooked with herbs and tender meats; sweet rice with dried fruits or sour cherries; vegetable rice, sometimes mixed with legumes… and for the ancient royal courts, there was even rice studded with jewels. Over time, four methods have developed for preparing Persian rice: kateh, damy, chelow, and polo. 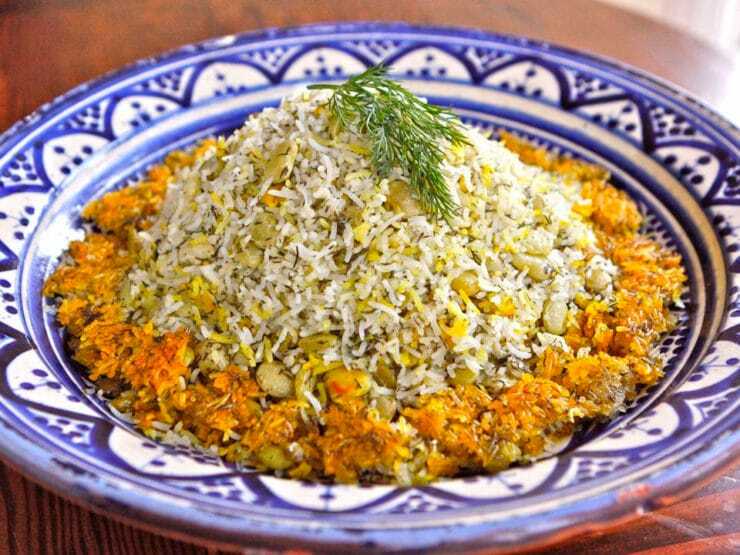 Kateh is simply rice steamed with water, salt, oil or butter, and sometimes saffron. Damy is rice steamed more slowly and mixed with uncooked ingredients, like beans or grains. Chelow is parboiled rice mixed with seasonings and/or herbs, then slowly steamed to form a crispy tahdig (sometimes spelled tahdeeg). Polo (or polow) is a variant of chelow in which aromatic ingredients like meat, fruit, and/or vegetables are mixed into the rice. Polo rice dishes are popular for their complex, mouthwatering flavor combinations. 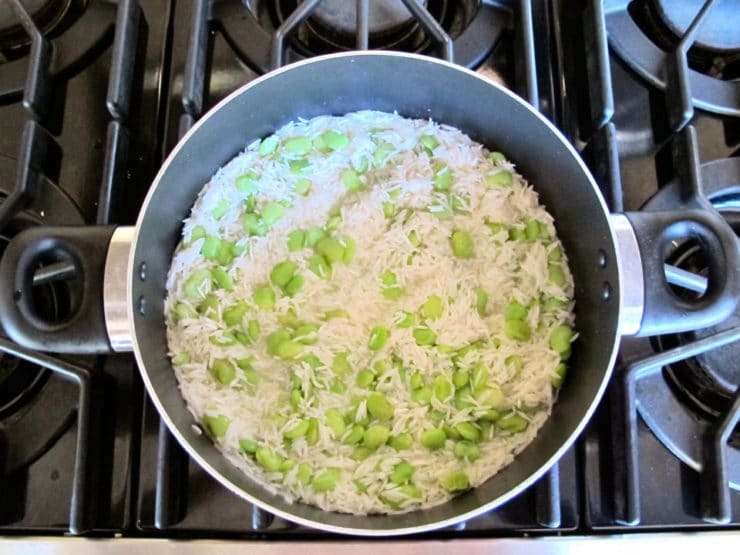 Which brings me to today’s recipe: Persian Dill and Lima Bean Rice. This is my favorite Persian dish, and I’ve spent the past two years looking for the perfect recipe. 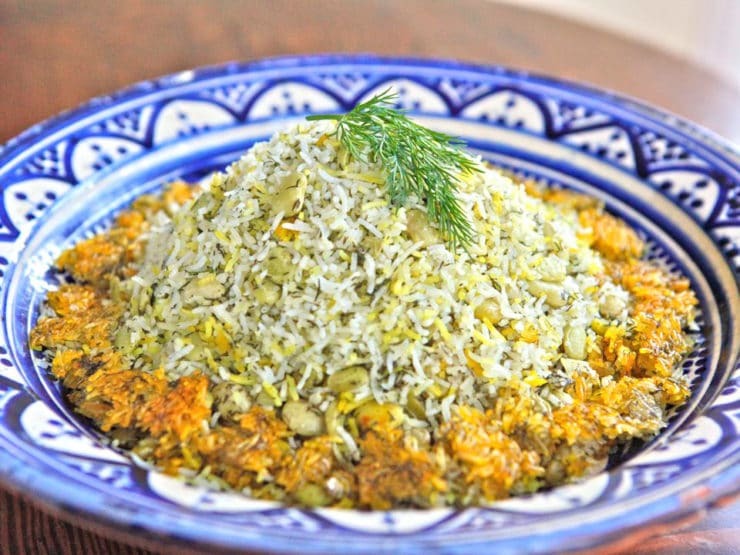 The original version of this dish, Baghali Polo, is most often made with young, fresh fava beans. The version I’ve grown to love is made with lima beans, but you can also use fresh young fava beans if you wish. I wanted a non-dairy version for my kosher readers; Persian cooks sometimes use butter or ghee and yogurt in their rice, but Jewish cooks prefer to make it dairy-free so it can be served with a kosher meat meal. I tried many versions from various Persian and Sephardic Jewish cookbooks, but I was never completely satisfied with the results. Then I had my Persian Jewish friend Farah teach me her way of making it. 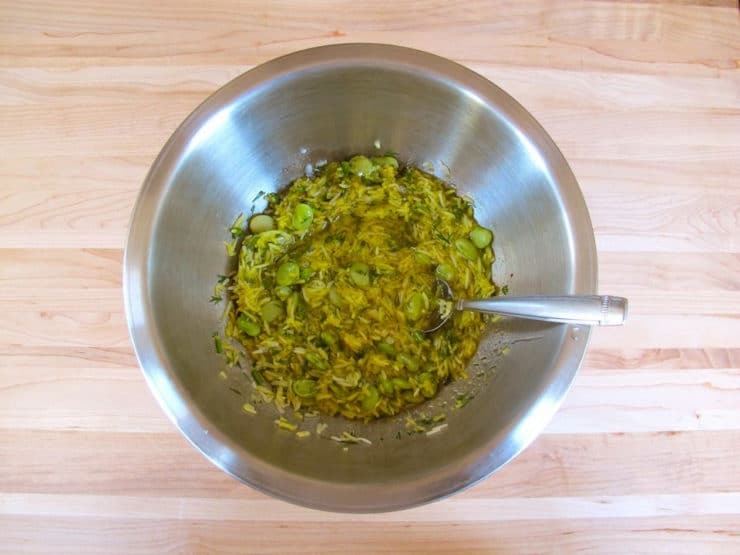 Over time, I was able to combine the methods I’d learned to develop a terrific recipe. The most challenging part was figuring out how to create a crispy, golden tahdig. The word tahdig is Persian, meaning “bottom of the pot.” It’s a layer of crispy rice that develops on the bottom of the pot while the rice is cooking. It’s crunchy, delicious, and considered the “prized” part of the rice. The talent of an Iranian cook is often measured by his or her ability to create a quality tahdig. Making a tahdig requires a specific set of cooking conditions, and it takes some practice to get it right. I’ve attempted to provide clear, step-by-step instructions that will help you achieve a beautiful tahdig. Make sure you have a nonstick pot on hand– any 5 quart nonstick pot will do. I generally don’t like using nonstick cookware, but I bought a cheap 5 quart pot from the grocery store just for the purpose of making Persian rice. If you have trouble the first time, don’t be discouraged… stove heat and pot thickness can vary, which means it may take some practice with your home equipment to get it just right. 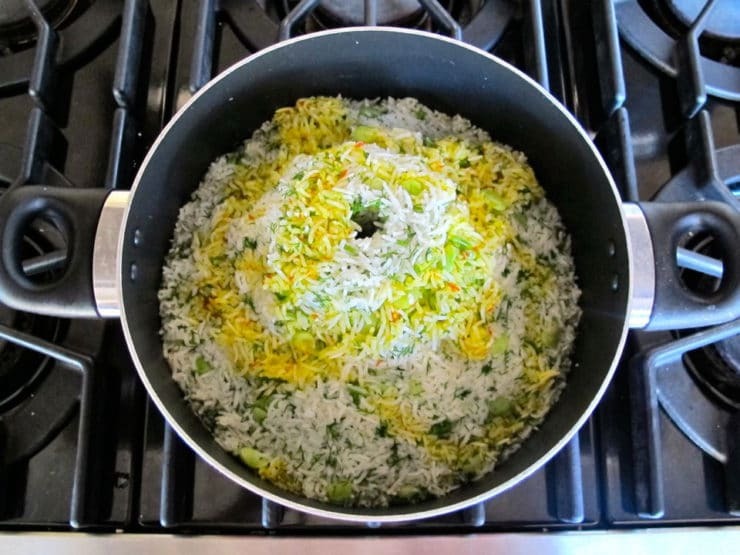 Even if your tahdig doesn’t turn out perfect, your rice will still be delicious. Promise! This is one of my all time favorite side dish recipes… it’s salty, fragrant, and tastes buttery without dairy. While I enjoy the sweet Persian rice dishes, I much prefer the savory herb flavor of this dish. It’s a lovely addition to a dinner buffet. Whenever I serve it at a party, my guests are intrigued, particularly if they’ve never tried Persian rice before. It’s a real treat! 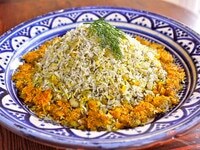 Recipe for Persian Dill and Lima Bean Basmati Rice with crispy tahdig. Kosher, Pareve, Healthy, Vegan, Vegetarian, Gluten Free, Dairy Free. Rinse and sort the rice for a minute in the colander with cold water. Pour the rice into a medium mixing bowl and cover it with 2 inches of cold water. Let the rice soak for 90 minutes. 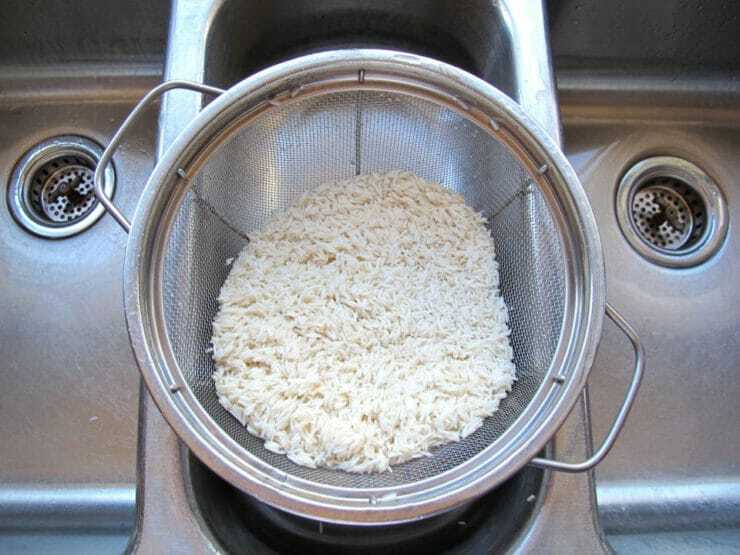 Drain the rice in a colander and rinse again with cold water, shake out the excess water. Rinse and dry the mixing bowl and set aside. 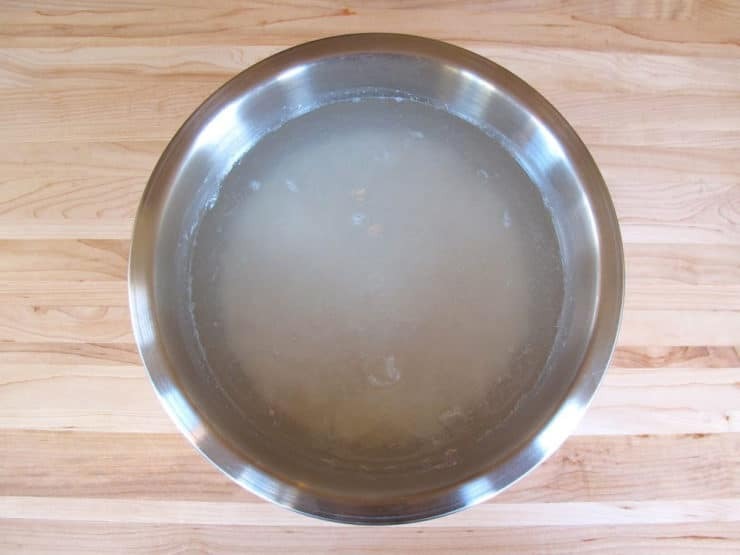 Bring 3 cups of water to a boil in a 5 quart nonstick pot (using a pot with a nonstick surface is important; it will help in the formation of the crispy tahdig). Pour in the rice, beans, and salt. Stir. Bring the water back to a boil. Let the mixture boil uncovered on medium high for 8 minutes. Stir the rice periodically during cooking. While rice is boiling, crush the saffron threads in a mortar and pestle. Pour 1/2 cup of hot water into the mortar and let the saffron soak. After 8 minutes of boiling, pour the rice into a colander and rinse with lukewarm water, then drain. Rinse and dry the pot and put it back on the stove. 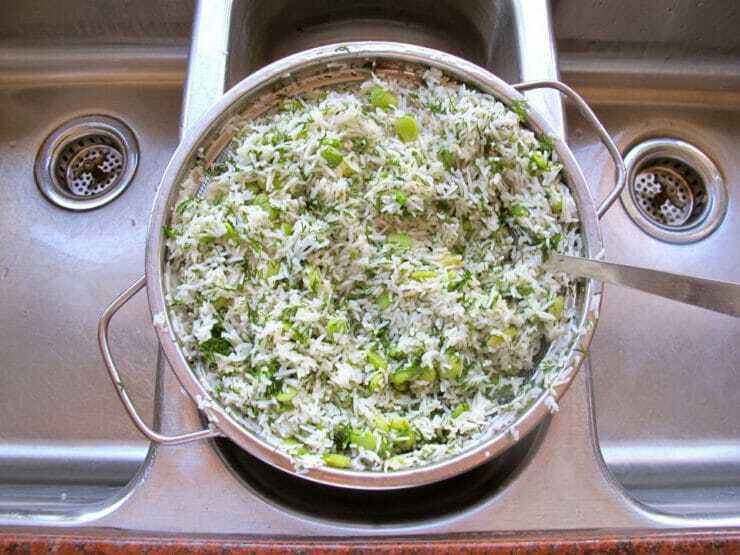 Stir the fresh chopped dill into the rice in the colander, making sure it is well mixed throughout the rice. I use about 1 cup of chopped dill; you can use more if you like a very green rice with a strong dill flavor. In the medium mixing bowl, stir together 1/2 cup vegetable oil, half of the saffron water, and 1 1/2 cups of the cooked rice. Spread the oil and rice mixture in an even layer on the bottom of the pot. This will become your tahdig. Scoop the rest of the rice out of the colander and into the pot, forming a volcano-shaped mound in the middle of the pot. Make a hole in the center of the volcano with the handle of a wooden spoon, pushing it almost to the bottom of the pot. 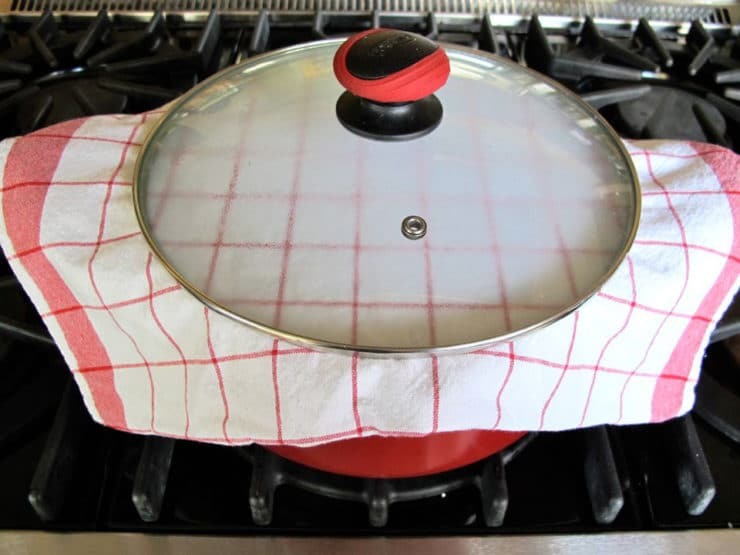 Place a thin kitchen towel over the top of the pot, being careful not to let the towel get too close to the heat source. Place the lid tightly over the top of the towel. Turn on the heat to medium and let the rice steam for 10 minutes. 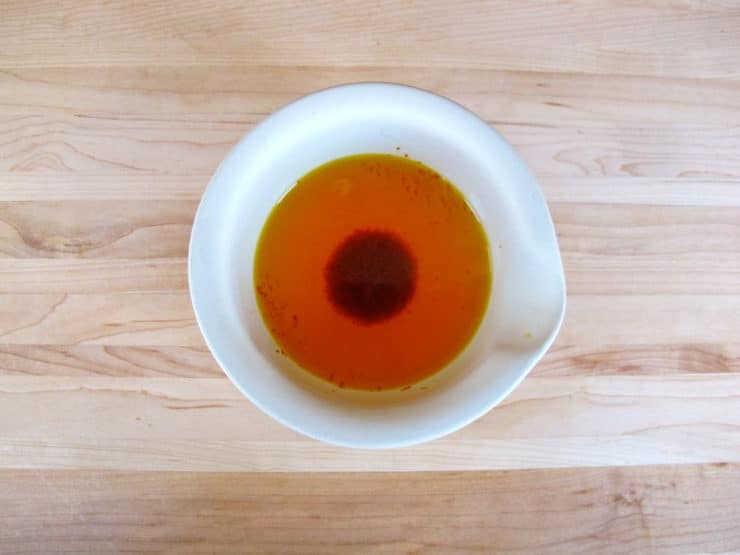 Meanwhile, mix together the remaining saffron water with remaining 1/4 cup of vegetable oil. 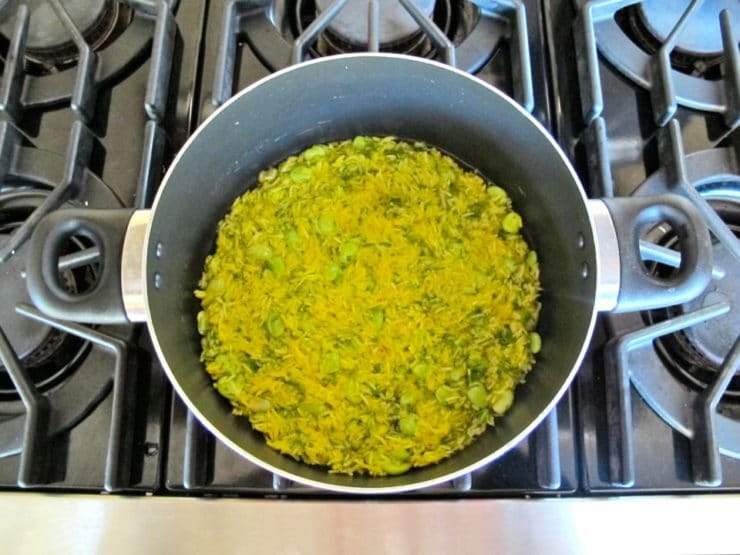 After 10 minutes, remove the towel and lid from the pot and pour the saffron oil mixture evenly over the top of the rice. Replace the towel and lid. Turn heat to low. Let the mixture steam for 45-50 minutes longer. Move the pot to a cool surface and let it rest for 5 minutes. When ready to serve, you have two options. Option 1: Scoop the rice out of the pot and mound it onto a serving plate or tray, leaving a thin layer of rice undisturbed at the bottom of the pot. 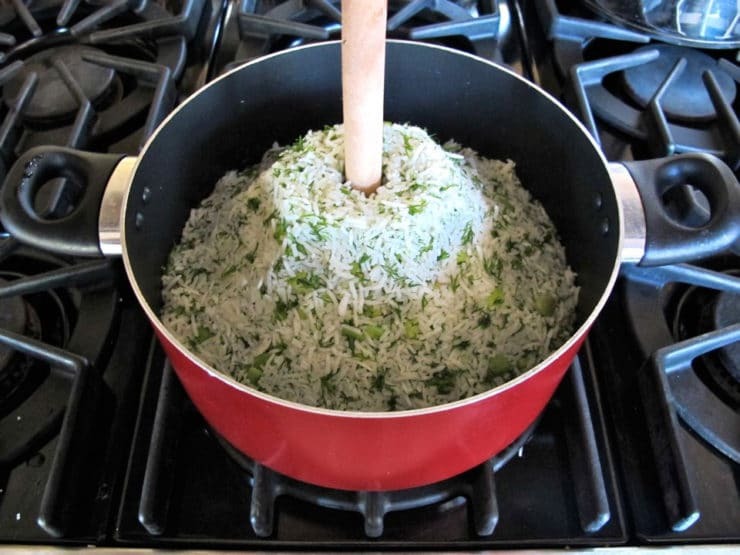 Use a spatula to loosen the crispy tahdeeg from the bottom of the pot and arrange the pieces around the cooked rice. Garnish with a little fresh dill, if desired. Option 2: Place a large serving plate upside down on top of the pot. Invert the pot quickly and gently unmold the rice from the pot. 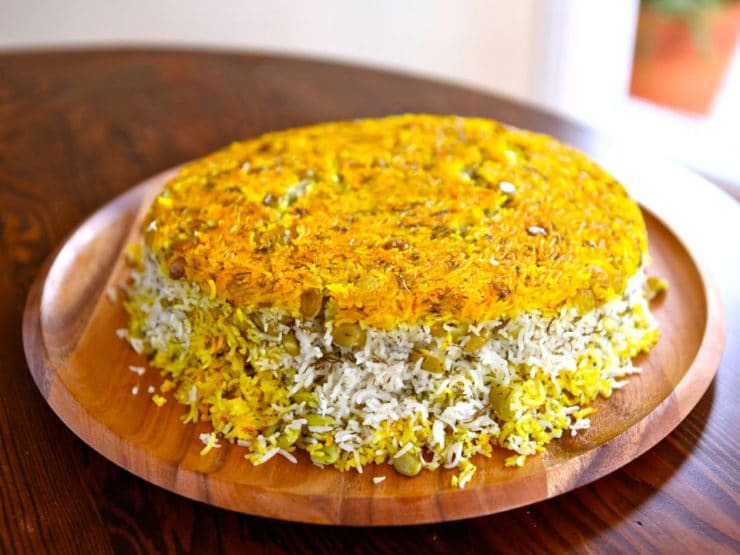 This will keep the tahdig intact and create a cake-like effect with the rice. I’m really excited to try this recipe. Is there any way to stop the video that starts playing every time I scroll down the page? I don’t mind watching an ad in exchange for a free recipe, but once I pause the video, it starts automatically every time I scroll down. It’s unbearable. I really wanna try this recipe, but I can’t look at the webpage long enough. Help! Hi Jonny, that shouldn’t happen – it must be a glitch. Can you please tell me what browser you are using and if you are on desktop or mobile? I will look into it right away. Am planning to try your recipe this weekend. Have made Baghali Polo before, and the Iraqi friend who taught me added finelynchopped onions. Have you heard if that Tori? My rice at the bottom isn’t crisping, it’s just oily and like the rest of the rice. What am I doing wrong?! Tastes delicious however! Hi Alina, Tori’s assistant Ashley here! I would suggest trying a slightly higher heat level next time, but be careful. There’s a fine line between crispy and burned. Hope this helps! Thanks for this recipe Tori, I just made it tonight and although it took a good while as there are many processes, it came out really well and I got myself a crispy bottom! It didn’t come out clean, we had to spatula it off, but everyone said they loved it! And my English-Iranian friend says my tahdig looked good in the pic I sent over 🙂 Which is a compliment indeed! My older sister had a Persian roommate while in graduate school. After graduation she went to Iran and lived with her roommates family and taught English. 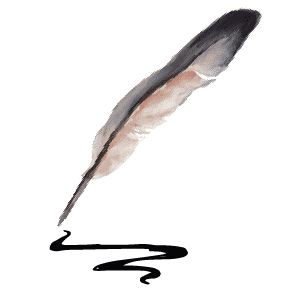 She came home with amazing stories and exotic recipes that dazzled my teen eyes and senses. I have always loved her Persian cuisine. She and her husband found out in receent years he has kidney disease which requires less nutritious” (protein heavy) meals. After a lifetime of organic glorious nutrition and vegetable rich cooking – how to cook and still have flavor and enough calories to support his very active cycling and hiking. She made this while I was visiting last year and I still can close my eyes and remember the fresh garden dill and saffron. Curiously I lost 10 lbs while there but sat more and ate more than I do at home. I am G/F and D/F K Thanks so much for the recipe and pictures – now I can do it myself. For the last steaming part, could i use a ricecooker? I live in a dormoom and don’t have a non stick pan hahaha. Hi Yasmine! Yes you could, but you won’t end up with a crispy dahdig at the bottom. 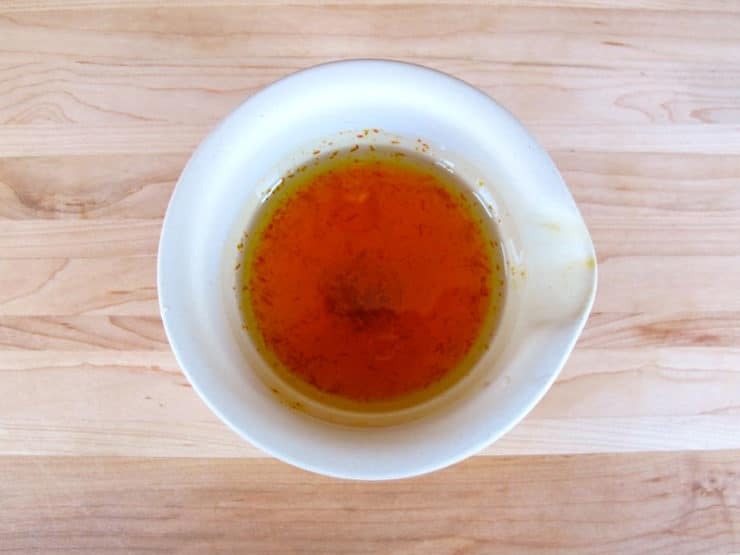 In fact, the bottom part where you mix the oil and saffron water will just by oily, most likely, so you’ll probably need to stir that part into the rice. I can’t be certain because I haven’t tried it with a rice cooker, but this is my guess. I’ve been making tadigh with my rice for years without a non stick pot, it takes a little practice but you can do it. Use a good quality pot and some butter, it may stick a bit but you can get it out with a spoon without much effort. I grew up eating this dish and it’s wonderful. I skip the saffron but i use butter. I actually made this in the rice cooker and it turned out perfectly! I got a nice crispy goldten tajdij at the bottom. However, I have the option to steam only at three differnent temperatures. So, if you can adjust the temp, and also get it to steam only not boil then it can work. Hi, I liked your recipe..even though I was cooking this rice for ever..its one of my favorite to..I usually cook lamb shanks on the side, to make it complete meal, and use the lamb broth instead of plain water to cook the rice. on the the side I would make yougurt and cucumber with garlic and dry mint, some call it tsazikki (I hope I spelled right, its Greek word!!)).. It just taste out of this world with lamb which I would serve it on top of the rice and the yougurt. Is it possible to make this with a cast iron pot? Hi Pearl, I was taught to use a nonstick pot by the Persian woman who shared this recipe. I have never tried it in a cast iron. While I want to say it should work if the pot is well-seasoned, I can’t be certain because I haven’t tested it myself. My Iranian wife uses a double thickness of a good quality paper towel instead of a cloth towel. It’s easier to get the size just right and not worry about the extra towel catching fire. Good tip David! I just made this recipe again this past weekend and found myself worrying about the towel, as usual. Hi… i am from Iran and i have to say that this dish is definitely one of the most delicious and favorable dishes in Iran. And i am glad that you liked it…. How interesting to come across this recipe! 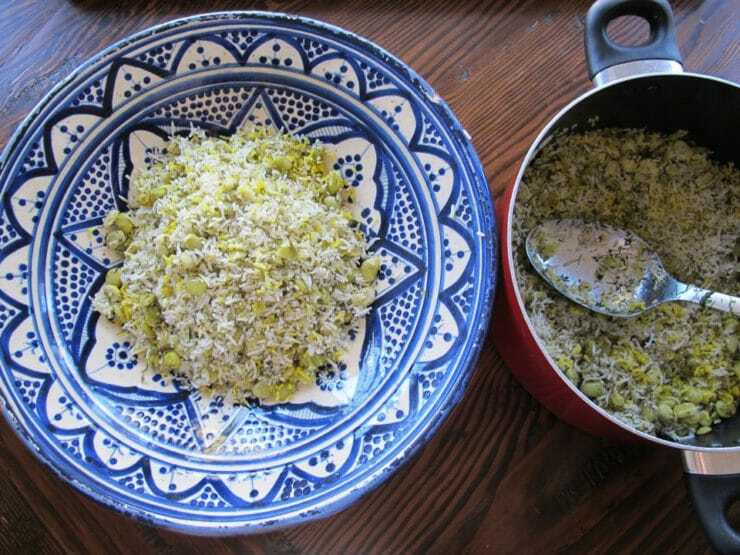 I make a rice dish exactly like this with fava beans and serve it with boiled eggs. Instead of expensive saffron, I use a little turmeric (curcumin). I didn’t know about this Persian dish. I make a similar recipe boiling the rice with tomato (passata or fresh tomato and chicken stock) the sticky flavoured rice at the bottom is delicious. I sauted the lima beans in garlic before adding them to the rice. And I used 3 bunches of dill. Yum. The only tricky thing is the tahdig. I didn’t want to burn it so I put the flame on medium, which made it soggy. At the very end I scooped out all the rice and put the flame on high. It worked. Not as well as I would have liked but it did make the rice crispy. Wonderful Tala! Comments like this make me happier than you can imagine. I really strive to make everything on the site as authentic, accurate and delicious as possible. Holy cow! I just made the rice and it is OUTSTANDING! The only problem I had was the fresh baby lima beans which is sadly my favorite part of the dish 🙁 I unshelled them and put them in boiling water, before I knew it, they overcooked and turned to mush 🙁 So, i had to omit the lima beans from the recipe (I wanted to cry). Other than that, the method is FULL PROOF! I followed the recipe to the T and it turned out soooooo delicious!!!!! The only slight modification I will make is less oil (I used EVOO because that’s what i had on hand). The rice was perfectly cooked (fluffy) and the tahdig was superb!!! I often have huge issues making rice but given this steams the entire time, it’s so difficult to mess up. THANK YOU for this wonderful recipe! I scouted the internet forever, this seemed to hit home the most, and it sure did. So happy you had a great experience with this Eve! If using fresh lima beans they need only be steamed for a few minutes, I don’t suggest boiling them. Thank you so much for this recipe. I have made it atleast 4 times in two months. I love it. It’s become an absolute favourite. The recipe is so well written so it makes it easier to cook this dish. That’s great to hear Ish! Have tried other recipes but this is the best one! Delicious! Great to hear that Kara! It took me a long time to hit upon the right combination of elemenths/methods to achieve the proper flavor and that lovely golden tahdig. So glad you enjoyed it! as always they look so good !! My son´s M-I-L makes a sweet version which is excellent. Thanks Fariba! I absolutely love Persian food. It is a joy to make and eat! This looks absolutely delicious. I have learned to make it, since my community is predominantly Persian and I love their cuisine. If you have a recipe for a good jujeh kabab, please post it on FB. That is my favorite. I some time put thin slices of baking potato at the bottom of the rice for the tadig. That is delicious as well. Mmmmmmmmmmmm!!! I go to Penzey´s for my Saffron (actually for all herbs I don´t grow myself), I highly recommend them. Good prices for vanilla beans also, which I go through like crazy. I have many Iranian friends and have made this rice numerous times. I would not use brown rice (which I cook frequently) as it cooks at a much different rate and gets very soft when it is cooked. I don’t think it would work here texture-wise. This is a very authentic recipe! Thanks for breaking it down Shiksa! My Mom is the best Iranian cook, (IMO of course) but she just does it by sight or whatever so I can never get the tahdeeg right! I’ll be using this recipe this weekend! Ps I think grilled salmon or any lamb preparation is the best protein for this amazing rice! 🙂 thanks again! You rock! We have a Persian restaurant right here in AZ. This looks incredible. I actually have saffron threads in the cabinet and have wondered what to do with them. This rice sounds great. Can’t wait to try it. Now, to just get some lamb..
Love the idea of the saffron threads..but too many carbs in rice, binding, and no nutritional value..I´ve been staying away from it. I am going to try this. I have been saving my $$$affron for a special dish! Hello, it looks yammy! Thank you for the step by step with photos.. Before I try this recipe I’m wondering the rice not becoming over cooked because 90 minutes soaking and another 45 Minites cooking. 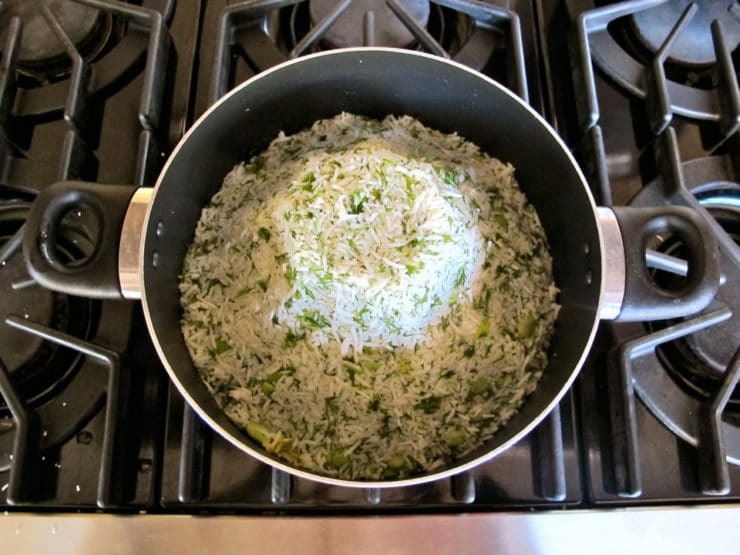 Hi Sam– no it will not become overcooked, this is the way basmati rice is traditionally prepared in Persian cuisine. Enjoy! I used a pot that was a bit too big so it didn’t come out perfectly (some of the tahdig burned on the bottom) but the flavors were still superb! I couldn’t find frozen limas so I used green peas instead. Thank you so much for sharing this special recipe. I had no idea that the tahdig was such a treasured part of this dish. My best friend’s Mom made this dish when I was young and I had some terrific memories of being at their house when this was dished up, cooked with chicken sometimes too. My husband made this for me today with the saffron and everything and it is truly amazing. It is just like the dish I enjoyed as a kid and have such wonderful memories of. I love it, thank you so much, this made my day! I’m so happy to hear that Kristin! I really adore this dish, it is one of my absolute favorites. If you have leftovers, try scrambling with some eggs in the morning for breakfast. Might sound weird, but I love it! My family really enjoyed the recipe. Thank you. Might anyone give me a tip on making the tahdig with a layer of potato? This was my favorite as a youth, but I never learned to prepare it. This is very good made with basmati rice and cooked chicken mixed in (the rotisserie chicken at the grocer) and served with persian yogurt. If you are on a budget, you can leave out the saffron (the pretty color and subtle flavor will be missing) and use long grain white rice without soaking and cook in lots of boiling water for 7 minutes. When you take a grain of rice out of the boiling water and break it in half, it is done when the middle has a bright white center about as big as a pin with an outer ring that is more translucent. Do not over-boil the rice as it will become sticky instead of seperate grains. The rice will cook the rest of the way when it is being steamed. Do not skimp on the oil. It is what helps form the tadiq. If you skimp, you could end up with charcoal. The burning taste will taint the whole pot. This process is very worth the trouble as the dish is delicious. I too hate lima beans – terrible memories of them when I was a kid. I would fish them out of my mother’s vegetable soup and line them up around the rim of the soup bowl. So, chickpeas? Cannellini? What would you recommend? I have been looking and looking for a recipe exactly like this for years, no joke. I too have scouted out middle-eastern cookbooks and have amassed recipes similar to this without the perfect results. Not only have you shown a few things that will make my cooking better (like 10 minutes to form the tahdig instead of me always burning it!!) but you have provided lovely pictures. Bless you and I really am enjoying your blog which was recommended by the Pioneer Woman. Just saw this comment Natalie, so happy you liked the recipe! I like scrambling some of the leftover rice with eggs for breakfast the next morning. Sounds kind of weird, but it’s delish! Thanks so much for your recipe + pictures. 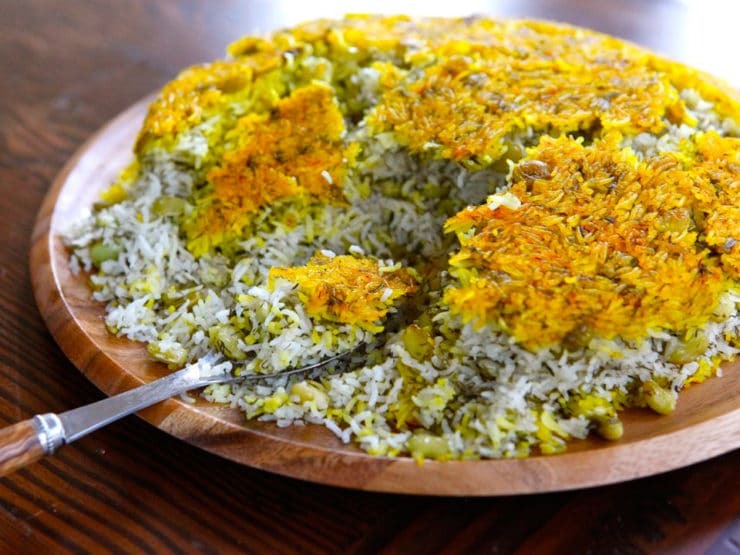 This is one of my favorite persian rice dishes. I like it best w/ peas. In Great Neck I’ve had it prepared that way. In Los Angeles + Beverly Hills The cooked it This way w/ the Lima Beans. I’m a Baby Nurse and many of my Clients + friends are Persian. I love almost all of the dished the have prepared. I also like the sweet rice dish w/ carrots, raisins , + cinnamon. Tori this is unique to me. I don’t see much of this type of food where I live. I must give this one a try. I have never tried that towel trick before. Wish me luck with it. I tend to be accident prone. Best to use a towel large enough for the loose ends to fold up on each other on top of the lid. That is least risky way. Works fine! My question is as Kent’s…. Curious if this would work with brown rice. Can’t think of why it wouldnt… Looks delish! Hi Barbara, hi Kent… this is a great question. I asked one of my Persian friends, who advised against it– she said that the texture of white long grain basmati rice is closest to traditional Persian rice. Brown rice takes longer to cook, and will likely not turn out as fluffy as white basmati. It also doesn’t have the lovely perfume of white basmati, which means the dish will be lacking the proper aroma. That said, if you are absolutely set on using brown rice, long grain brown basmati rice can be used (don’t use short grain or American-style rice– long grain basmati is important). I am passing along her tips, so keep in mind that I haven’t tried this myself and can’t make any promises. You’ll need to presoak it for the full amount of time, and parboil the rice till it’s an al dente texture– soft but firm, and not at all crunchy. The parboil will take longer than with white rice, and likely will need a little more water to achieve the desired texture. Once the rice reaches that al dente stage, you can proceed with the recipe as written. Again, I make no promises, so if you’re able to try it please report back to us and let us know how it worked for you! Will this work with brown rice? Yes, only if it is an aged, basmati, long grain brown rice. I love tadhig, had a chance to eat Persian rice a lot with friends from Iran who are good cooks. We make the similar rice with lima beans and dill but not saffron. But I think the color just makes it prettier and unexpected. Beautiful. This is terrific, Tori! I had no idea there were so many names and styles for making rice! I bet this has an amazing flavor…thanks for the recipe AND the lesson! This looks delicious. The latins also have a word for the sticky rice at the bottom of the pot and in their culture it is also the favorite portion. They call it Pegao. I eat kosher and was delighted to find you blog. Ahamirat, what you are suggesting will make toasted (tough) rice, but not a crispy golden tahdig like you see in this recipe. This is such a yummy sounding recipe! Great idea. Yum!